Mitelli's vast production of etchings documents scenes of daily life, especially people and historical scenes. Illustrating the book by Lorenzo Legati entitled Museo Cospiano (Bologna 1677) this etching shows the interior of the museum owned by Marquis Ferdinando Cospi. Officially bequeathed to the city in 1672 the museum was housed in the Palazzo Pubblico along with the naturalistic collection of Ulisse Aldrovandi since 1657. The text describes the exhibits: things living on the earth, in the sea, fossils (naturalia), and artefacts such as coins and medals, sculptures, small bronzes and archaeological relics (artificialia). Some of the objects represented here are still recognizable among those surviving in the city museums. Among the Mirabilia there was also the “dimostratore”, a guide who was a dwarf. This collection is a good example of the XVII century encyclopaedic taste and seems to be inspired more by curiosity and wonder than by genuine scientific interest. It grew progressively thanks to contacts and exchanges with travellers and correspondents abroad. After having been moved to the Institute of Sciences in Palazzo Poggi in 1743 the Cospi collection was used for a didactic inspired by the Enlightenment ideas and based on a direct experience of materials. Following the Napoleonic suppressions and a crisis for the institute there was a new distribution and reclassification of materials in the age of Positivism. The collection was divided among different Museums in Bologna based on their subject or scientific field. Several of the pieces in the American Collection were bought by Luigi Pigorini in the 19th century and are now housed in the Pigorini Museum, in Rome. 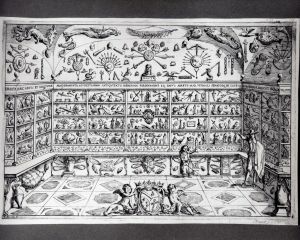 Marquis Ferdinado Cospi’s Wunderkammer is a good example of the encyclopedic collections fashionable in Europe in the Baroque age. It was composed of Naturalia and Mirabilia, a combination of items coming from the world of nature, antiquity, artifacts and scientific instruments. 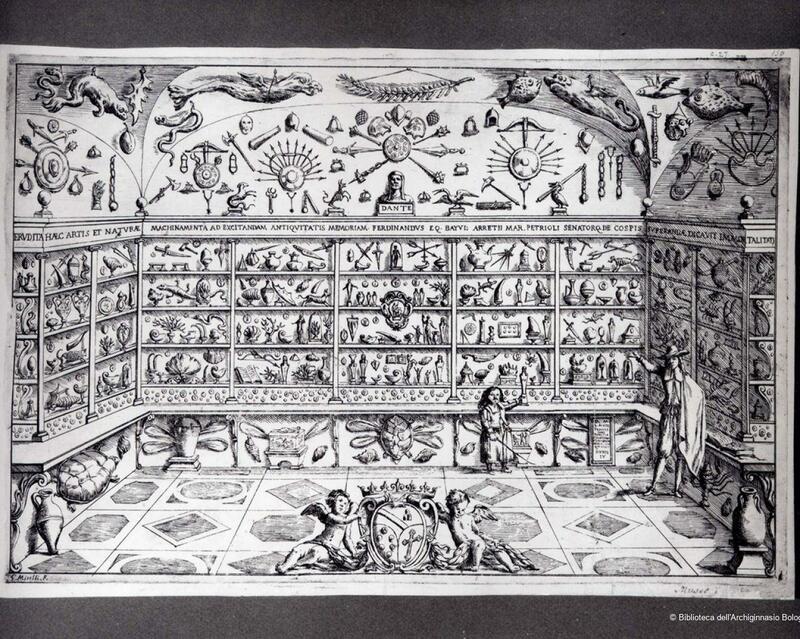 This etching was the first page of Cospi's Wunderkammer, published in 1677. It was probably made before this date, and certainly after 1667, when a short description of the collection was published. Legati, L. Museo Cospiano annesso a quello del famoso Ulisse Adrovandi e donato alla sua Patria dall' Illustrissimo Signore Ferdinando Cospi patrizio di Bologna e senatore Cavaliere Commendatore di S. Stefano, Bali d'Arezzo, e March. di Petriolo, fra gli accademici Gelati il Fedele, e principe al presente de' medesimi, descrizione di Lorenzo Legati Cremonese, Bologna, 1677. Gentili, C. “I Musei Aldrovandi e Cospi e la loro sistemazione nell'Istituto”, I materiali dell'Istituto della Scienze (exhibition catalogue), Bologna, 1979, p. 90, pp. 95-99. Laurencich Minelli, L.“Dispersione e recupero della collezione Cospi”, Atti e Memorie della Deputazione di storia patria per le province di Romagna: XXXIII, 1982 (1983), pp. 185-202. Gualandi, G. “Il Museo delle “meraviglie” di Ferdinando Cospi”, Dalla stanza delle antichità al Museo Civico. Storia della formazione del Museo Archeologico di Bologna (exhibition catalogue) (eds. C. Morigi Govi and G. Sassatelli), Bologna, 1984, pp. 125-128. Graduated in Modern Literature, specialized in History of Art at the University of Bologna. She is a specialist in Bolognese and Emilian art of the 16th and 17th centuries. Some of her essays are dedicated to museology and collecting, decorative and applied arts, revival in the Visual arts between the 19th and the 20th centuries. Since 1985 she works at Musei Civici d’Arte Antica of Bologna, as curator of the Collezioni Comunali d'Arte.